Let me say this much up front: I still love The Current. I still have the dial on my car tuned there permanently, I still listen to the podcasts when I get a chance, I'm still a member. I'm saying this because the rest of this post is going to sound like Current-bashing. I still think it's a wonderful station - I just don't like the direction it feels we're heading. A short primer: A few years back, a magical public radio station was born. It billed itself as "the antiformat" station, gave the DJs a massive amount of freedom, and played music that was always fresh, varied, and exciting (and usually quite good besides). Then, somewhere along the line, someone decreed that certain songs needed to get certain amounts of airtime. DJs started being told what their playlists should contain. One DJ quit over the issue. And people like me started wondering why the same song was playing every day on my 20-minute commute. Not that it's a bad song, just... I don't need to hear it every single day. I don't need to hear any song every day. But, rather than complain anecdotally, I decided to use the power of numbers. The Current makes a massive history of their playlist publicly available on their website, dating back to 2005. So I wrote a screen-scraper in Python to pull all the songs off the site and store them in a sqlite database, which I could then run queries on and make pretty spreadsheets and graphs. On methods: I tried to normalize all the data before storage, such as stripping non-alphanumeric characters and converting to lowercase letters. This helps increase correct matches. I also ran queries against songs grouped by (artist, title) to avoid false matches on title alone. I don't think I screwed anything up, but I have no formal training in statistics, so no promises. All code used to collect and analyze the data, as well as the spreadsheets and graphs of the results, are available for download under the GPL here. The question I wanted to answer was "is The Current's playlist shrinking, and how badly?" Generally speaking, a "good" playlist should play many different songs, and not play any particular songs too frequently. The challenge is to coax a subjective measurement like "good"-ness out of a massive pile of song listings. 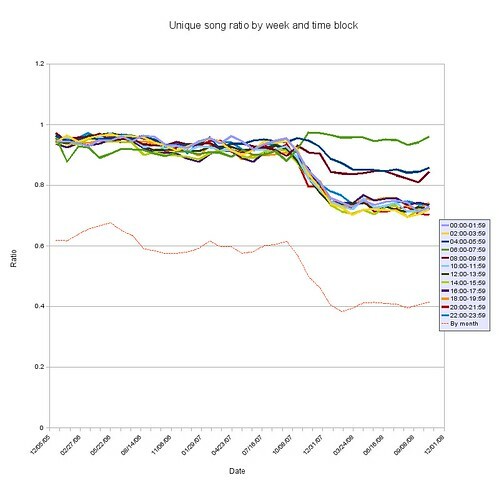 The first measure I have is the "unique song ratio" - that is the number of distinct songs played in a period of time compared to the total number of songs played in that time. So it should be a fairly good measure of how much variety a playlist is offering. Higher is better - it means of the total playcount, there is a larger selection of songs played. The numbers themselves are somewhat arbitrary, but there's a pretty clear and shocking trend visible here. Somewhere near the end of '07, things take a massive dive. The ratio over a week, which was hovering around 0.9, drops to nearly 0.6. 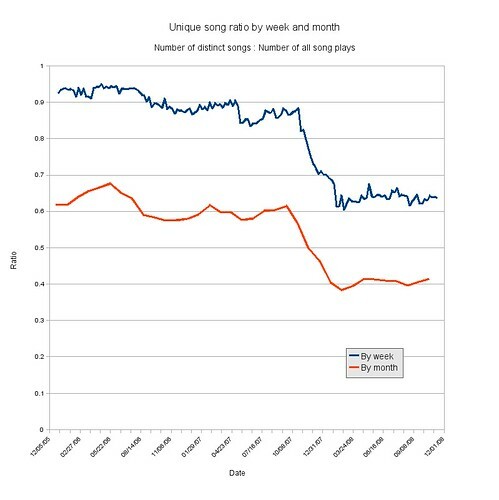 It makes sense that the ratio over a month is lower all along - over the course of a month, it becomes much more likely that the song you're playing has already been aired. But when the giant dip in the graph levels out, the ratio over a week has leveled out right around where the ratio over a month used to be. That can't be good. 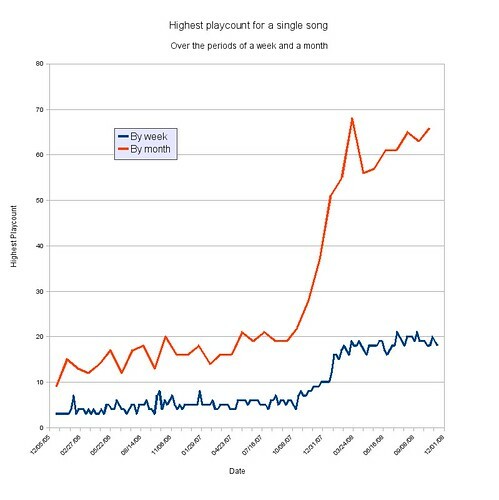 Similarly, we have average song plays, or the number of times a typical song will be played over a period of time. 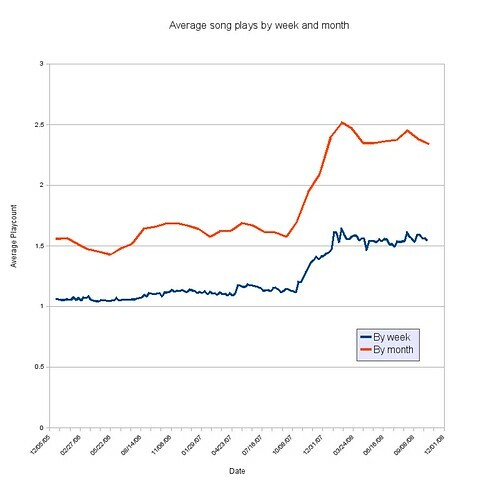 That same programming shift is visible here, peaking at an average of 2.5 plays per song per month and leveling out over 2. Of course, if The Current played every song exactly twice a month, I wouldn't have much room to complain (I might wonder if the director of programming had some nuerotic tendencies, but that's a separate issue). My concerns lie more in if certain songs are being overplayed. To further address that, let's measure the maximum playcount - the highest number of times any one song is played in a period of time. Again, the same trend is plainly visible. And this time, the numbers themselves are troubling. The recent end of the graph is somewhere between 60 and 70. That's enough to play the most popular song for a given month more than twice a day, every single day. The weekly count is up near 20, which is almost three times a day for that week. So... ouch. This isn't just a minor tweak to programming. To me, this looks like a shift in the very identity of the station. And I don't think I like the new Current as much as the old one. I don't want to get too hyperbolic. I'm sure these numbers would still look very good put up against a Clear Channel subsidiary, or really just about any commercial station. I would have loved to compile some numbers from one of those stations to have a good laugh, but sadly I couldn't find any that made old playlists available. If you know of one, I'd be interested to hear. All the complaints flying around are not because we haven't counted our blessings - it's because we know just how lucky we are, and we're afraid we're slowly losing our treasured station to the mainstream. So no, it's not the end of the world, and I'm not convinced 89.3 has sold out to The Man just yet. But I used to describe The Current to my friends as "single-handedly saving radio." And I'm starting to wonder if I can still count on them for that. Maybe it's time to lay the responsibility in Triple J's hands. I want to close with one more analysis. Curious if drive time or other factors would affect the playlist at all, I ran a set of queries for the same uniqueness ratio as above, but now broken up into two hour time slots throughout the week (and yes, I included the weekend, whether that's good or bad). The orange line along the bottom is the monthly value, included just for reference. As you can see, most of the time slots follow the general trend towards less variety very closely. There are three slots, however, that don't: those from 4AM through 10AM. The Morning Show runs from 5-9AM. Strangely, the 6-8AM slot actually takes an upturn as everything else heads down. Did they ramp up their eclectic selection in reaction to the station's overall homogenization? I don't know. At any rate, woo yay Morning Show! Too bad it's ending forever in a week. 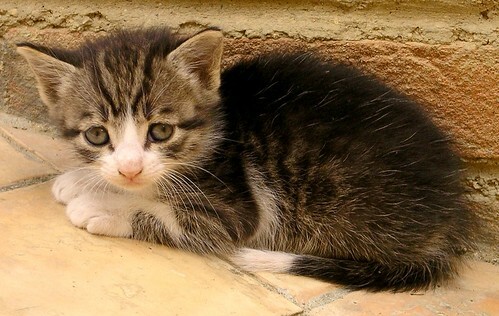 I wasn't sure how I felt, but then there was a sad kitten. I realized this article made me understand exactly how this little guy feels. You are an enormous nerd for putting this much effort into this post. Bravo, and nicely graphed. You should do a comparison for what you feel the worst-offending ClearChannel station is, if you can get their playlists.